"Study to show thyself approved unto God, a workman that needeth not to be ashamed, rightly dividing the Word of Truth"
All this comes out clearly in the pages of Holy Scripture, and is certainly involved in the expression in our English Bibles, "rightly dividing the Word of Truth." Of course, this expression is not by any means to be limited to dispensational teaching. It also implies putting each great doctrine of the Word in its right place. It has been translated, "cutting in a straight line the Word of Truth," that is, not confounding or confusing things that differ. It even suggests the thought of honestly facing the Word of Truth. Error in premise equals error in conclusion. 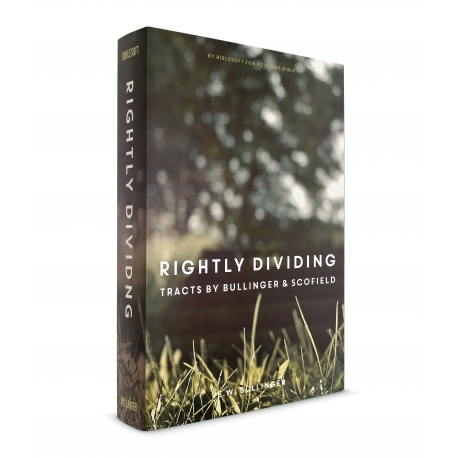 In this work Bullinger stresses the critical importance of accuracy when it comes to the study of Scripture. It is right here then that we need to be careful, and not read into the Word of God ideas out of our own minds which are not really there.